Every year, our family goes camping at a lake for the Hosh's (BB's dad) birthday. It's a big party over the course of a weekend with 10-20 of our closest friends and family and it was a tradition we were excited to share with BB. 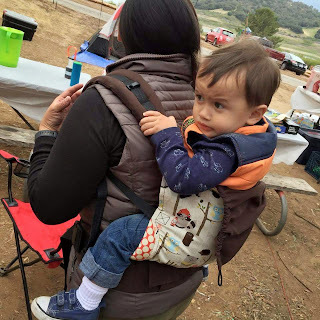 I previously wrote about Baby Camping Gear and a lot of the same items apply for toddlers. Today I'll get into more of the logistics. Yes, that is Campy Tula! When: Keep in mind that unless you are yurt, cabin or RV camping, you are basically subject to mother nature. 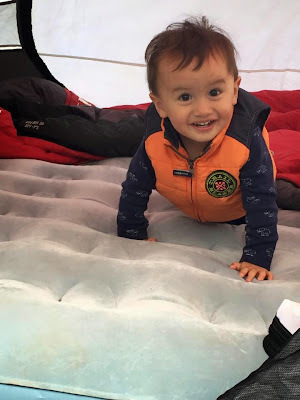 For infants, I highly recommend yurt, cabin or RV camping because temperature control is so critical. 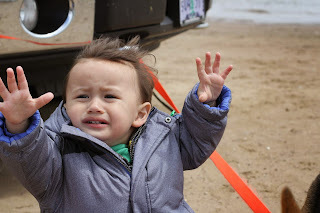 When tent camping with a toddler, looking for a time of year where weather is temperate is very important. Ideal temperature is one where it doesn't dip below 50 degrees at the coldest point in the night and doesn't heat above 85 degrees at the hottest point. Usually that is somewhere between late Spring and early Fall, depending on region. Just be careful not to pick a particularly rainy spot as being stuck in a tent with a toddler for hours is not a whole lot of fun. Check Weather Underground for historic temperatures at your camping location. 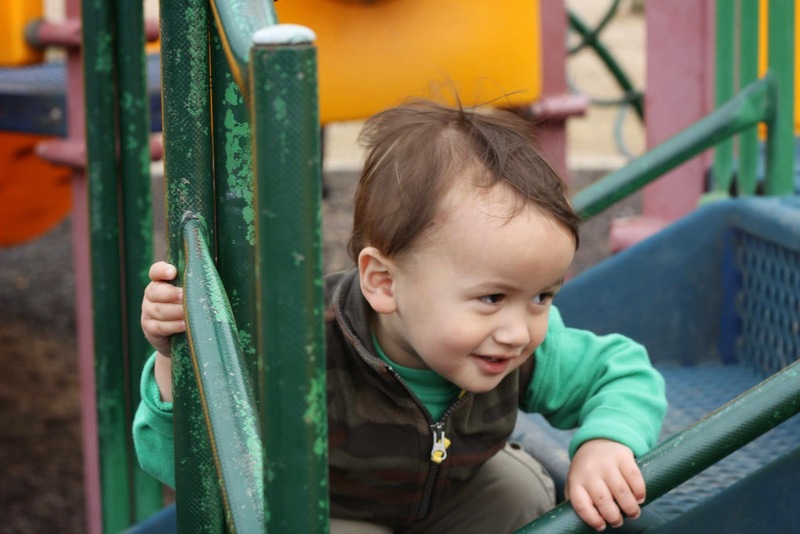 Take me to the playground! ReserveAmerica allows users to plug in the amenities they want and a date range of travel and it'll provide a list of campsite that meet that criteria. It's a good place to start but does not include all KOA sites. Also, most private campsites and many county run campsites are not available on ReserveAmerica either. Food: Since camping is a tough balance of bringing enough to be comfortable while fitting in the space available in the car to get it to the campsite, food can be a bit of a challenge since many fresh foods (read: healthy foods for toddlers) need to be stored in a limited space cooler. I suggest apples, oranges and fruits that don't require refrigeration. Freeze dried veggies from NurtureMe are great, as are prepacked veggies like Libby's Vegetable Cups. In the cooler, I always make sure to have cheese sticks and carrot sticks as I know he'll eat them. Otherwise, I try to plan a menu of food that is relatively toddler friendly. Clothing: Dressing toddlers for camping is just like dressing for adults. Plan outfits in layers as weather can go from hot to cold. Bring extra pairs of socks. A pair of comfy boots, like Uggs are simply amazing while camping for comfort. For BB, I pack a onesie, a long sleeve T shirt, a pair of shorts, a pair of pants and two pairs of socks for every day we are camping. Then I add a hat, mittens, a vest, a thin jacket, a thick jacket and a pair of snow pants. One pair of walking/playground shoes and a pair of warm boots rounds out his clothing options. Toiletries and Medicine: Pack all the things in travel sizes in this category. Things toddler needs everyday, from comb, toothbrush, toothpaste, shampoo, bodywash, towels, lotion, diapers, wipes, diaper rash cream, sunscreen. Add insect repellent, toddler Tylenol, character band-aids, face, nose and hand wipes, nose frida and that usually covers most bases. Tents: Keep in mind that the larger the tent, the harder it is to keep warm inside the tent. The general survivalist advice on the size of a camping tent is to get the smallest tent you can comfortably fit in if you are cold weather camping. A larger tent can be better if you are hot weather camping, especially if outfitted with enough zip windows to open and allow air to circulate. Sleeping Bags: There are a lot of cutesy toddler sleeping bags on the market. Very few of them are rated for cold weather, many of which are mummy bags. I could not get BB to like a mummy bag since he doesn't even like to sleep with a blanket. Instead, I bought him a one piece snowsuit to wear instead. I also brought footed pajamas. If it was mildly cold, BB slept it footed PJs, if colder, he slept in the snowsuit and in very cold weather, I had the option of layering the footed pajamas and the snowsuit. Mattress: We personally use an Aerobed as our camping mattress and we cosleep at home so cosleeping at camping was a no brainer. An alternative is to bring separate mattresses so toddler can sleep on one while mommy and daddy sleep on the other. Low maintenance campers often just use a bed roll which provides a light padding against the ground. Look at my tent guise! Camping Chair: There are a lot of camping chair options out there. When Ben was an infant, we used his stroller as it was easier to move him around. He now has his own folding camp chair that he loves. Whatever low space chair option a toddler will happily sit in is the right seating choice for camping. Toys: Keep in mind whatever is taken camping will likely come back very dirty, damaged or get lost and never come back at all. So unless it is a must have everyday toy for BB, I leave all the valuable toys at home and bring easily replaced, small space toys. Baseball sized balls for throwing, bubble wands, small water guns, etc. This past camping trip, BB's Aunt Kar bought him a remote control model ATV which he went nuts for. It was perfect for outdoors since there is just so much space to go camping. Safety Precautions: Aside from avoiding campsites right on the water, avoid campsites that are very close to steep drops or otherwise unsafe terrain. In addition, consider campsite dangers. For instance, this year, we brought a dog gate to go around our dutch oven as it often sits unattended while things bake away inside. The dog gate prevented BB from trying to touch it's very hot exterior. I also had to make sure that any moment I would be busy cooking for the camp, I put someone responsible in charge of watching BB. Usually that was the Hosh but at other times it was FIL or our very good friend and BB's favorite Uncle Friend Jer. Even then, I had eyes on him religiously. Between being outdoors without boundaries and having an open fire, camping does add another level of safety worries. All in all, camping with BB now that he's aware of his surroundings is simply amazing. He picked up new words, explored a new environment and just had a really good time. He got to see someone catch a fish, see birds fly across the lake, watch wood burn in a firepit and experience sun up and sun down around him, without walls block his view. He slept well and had very little fussiness except when he wanted my attention as I stayed fairly busy feeding a camp of 22 people this year. We loved it so much, we're going camping again this weekend!